Fr. Mullers Homoeopathic Medical College has his post graduation at Vinayaka missions Homoeopathy Medical College, Salem . 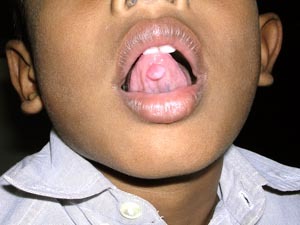 A boy aged 8 years presented a swelling in the sublingual region since 6 months. No pain or irritation; Swelling started as a pin head size and increased gradually to the present size.He was advised excision of the swelling. Past History revealed recurrent cold and fever and had an attack of mumps at the age of 6.